After the last 12 days fasting of Anna Hazare, today resolution on Lokpal Bill has been passed in both Houses of the Parliament. On a motion moved by Pranab Mukherjee, Lok Sabha and Rajya Sabha passed a resolution conveying the sense of the House on the Lokpal Bill. By the resolution - Sense of the House, three demands of Anna Hazare 1) Citizens charter, 2) Lower bureaucracy to be under Lokpal through an appropriate mechanism and 3) Establishment of Lokayuktas in the states have been accepted. This again substantiates the power of peace and non-violence, which was followed by our 'Father of the Nation' - M. K. Gandhi. Visit these spiritual and touching website. At least we can support him instead of sitting idle. 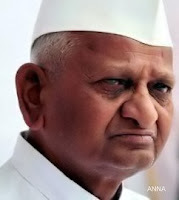 Like http://anna-hazare-lokpal-bill.in/ website to support anna-hazare!!! Are we all actually as naive as we are being while supporting Anna. It took a while to see the real picture, and it is so. The Anna team is going beyond what they had started out for. To ask for referendum, that is ridiculous. tomorrow if the people of J&k ask for one will the Anna team be in support of them too.